Suppurt all iPhone/iPad/iPod model, latest iPhone XS, iPhone XS Max, iPhone XR, iOS 12 and iTunes 12. ImTOO iPhone Transfer is the ultimate upgrade for your iPhone. Sick of iTunes' limitations? Then this is your solution. Transfer files between your computer, iPhone, and iTunes. 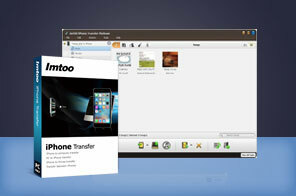 With the ImTOO iPhone Transfer, you are free to transfer music, videos, and photos from PC to iPhone and iPhone to PC. Backup and transfer your iPhone music and videos onto your computer and iTunes. Photos and videos shot by the device are also supported. ImTOO iPhone Transfer works well with all iPhone/iPad/iPod device, and fully supports multiple iOS devices simultaneously. No other iPhone transferring software currently on the market is able to do this with the same efficiency. As an iPhone backup software, it helps you transfer music, videos, photos and applications from iPhone to computer hard drive. It can also transfer files from iPhone straight to iTunes. Transfer music, videos, movies and photos from iPhone to computer for content backup. Copy photos from photostream to PC. Best iTunes Alternative can transfer music, videos, movies, photos on your computer to iPhone with no need to remove your original files. Import iPhone audio and video files to iTunes library. Support all iPhone/iPad/iPod types: iPad, iPad 2, iPad 3, iPad 4, iPad mini, iPad mini 2, iPad mini 3, iPad mini 4, iPad Air, iPad Air 2, iPad Pro (12.9/9.7/10.5 inch), iPod, nano (5th Gen), iPod mini, iPod shuffle, iPod classic, iPod touch, iPod touch 4, iPod touch 5, iPod touch 6, iPhone, iPhone 3G/3GS, iPhone 4, iPhone 5/5S/5C/SE, iPhone 6/6 Plus, iPhone 6S/6S Plus, iPhone 7/7 Plus, iPhone 8/8 Plus, iPhone X, iPhone XS, iPhone XS Max, iPhone XR. Copy playlist to iTunes and customize the column for showing file details. Connect several iOS devices and transfer files between them at the same time. Drag and drop application between PC and iPad, also support to manage application documents. Support importing contacts from many Address Book programs including incredimail. Photos and videos shot by the device are read and exported. Manage and organize iPhone photos into photo albums which you can create, delete and edit freely. Adding one photo into different albums is available. Provide multiple viewing modes: songs, albums, artists and genres. Add your desired picture for the file cover in the thumbnails mode. Easily convert DVDs to iPhone video and iPhone audio files.